Could you please attach an image and the se.log file? SpaceEngineer, Are you going to fix the comet tails glitch that causes the screen blackout? It is a very serious glitch that seems to only happen for one specific graphics card brand. The glitch seems to be related to the comet tail code. What is in the comet tail code that causes the blackout? Here's a screenshot and the log file. Thanks. then change false to true, save the changes and run again SpaceEngine to see if it's solved. 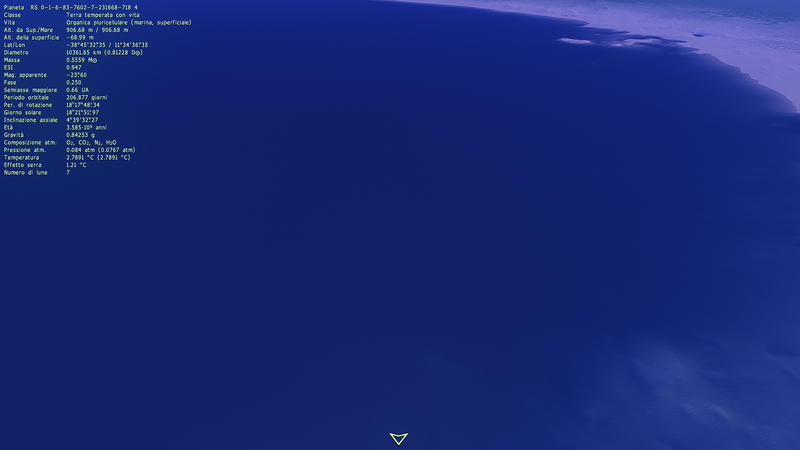 Be sure to make this changes when SpaceEngine is not running. Wicker1M, SpaceEngineer said recently that right now he doesn't have Intel HD hardware causing the bug so he can't check it, unfortunately it appears that disabling comet tails it's the only workaround so far..
Nope. That line of code is set on "true". I don't know if this can interact with the water effect, but i'm using Reshade. I don't know why, but when I tilt the screen certain ways in some systems, the screen flickers and blacks out until I turn it back, sometimes not even then, and I have to restart the game. dmale, have you tried by removing temporarily your addons? For Reshade I don't know 'cause I don't use it, have you tried by disabling it? This version crashes and freezes every time I exit the program, forcing me to perform a hard reset of the computer. Please fix this bug! The screenshot and the log file above are from SE with all the addons removed. Also withouth reshade 3d water doesn't work. dmale, I've seen a "no shaders" folder under Addons, that's why I'm asking. Then try deleting the cache directory, it's a good thing to do anyway. See if you can update the Nvidia drivers, latest are 372.90. Out of a clean re-installation, I'm out of ideas. I updated the drivers, deleted the chache directory and reinstalled SE. Nothing, all the same. Meanwhile, thank you so much for your help Mosfet! Judging from your log, you have a folder called 'plut' in the 'addons' directory. In there is a file called 'tg_terra_height.glsl'. SE uses this file! Remove it! This bug seems to be solved by 0.9.8.0.